In this white paper, you will understand how a local cash payment method will allow your business to access 80% of the population—that you currently aren't reaching. With the EBANX Boleto Cash Payment, a high converting version of the standard boleto bancario, you can reach 100% of Brazilian consumers. What is a Boleto Bancário? 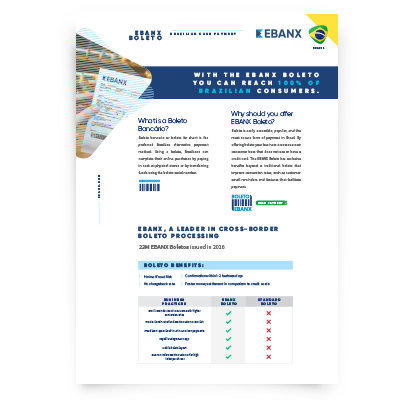 Why should you offer EBANX Boleto? How does the boleto works? Access all this information by filling out the form on the right to download the white paper and increase your sales in Brazil!